The European Commission (EC) has approved Ariad's cancer drug Iclusig for two forms of leukaemia, several months after the drug was cleared in the US. The EC gave the go-ahead for Iclusig (ponatinib) as another treatment option for patients with chronic myeloid leukaemia (CML) and Philadelphia chromosome positive acute lymphoblastic leukaemia (Ph+ ALL). 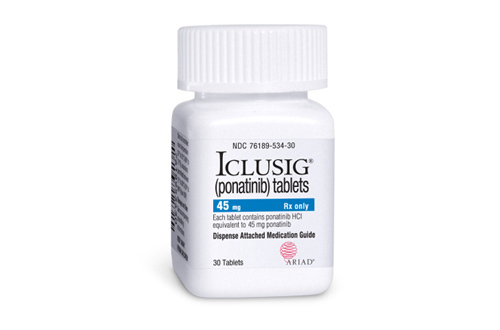 Specifically, Iclusig can be used in CML patients in the chronic, accelerated or blast phases of the disease, but only if they have failed treatment with Novartis' Tasigna (nilotinib) or Bristol-Myers Squibb's Sprycel (dasatinib). It can also be used in patients who are intolerant to Tasigna and Sprycel but are unsuitable for subsequent treatment with Novartis' Glivec (imatinib), as well as in CML patients who carry a specific genetic mutation known as T315I. In the ALL indication, the Commission gave a green light for Iclusig's use in adult patients who are resistant to Sprycel, should not take Glivec and who have the T315I mutation. Iclusig was approved in the US last December and was launched earlier this year, racking up net sales of $6.4m by the end of the first quarter on March 31 with a portion of that total coming from compassionate use in France under a temporary authorisation order. Aside from early sales in France, Ariad is now focusing its efforts on launching Iclusig in the UK and Germany by the end of the month, with a roll-out in other EU countries that require pricing and reimbursement approval in the following months. The initial emphasis will be Benelux, Scandinavia, Ireland and Austria. Ariad's chief executive Harvey Berger said last month that the product has got off to a strong start and is outstripping the early growth trajectory of Tasigna, which is one of the fastest-growing drugs in the class and crossed the $1bn sales threshold last year. Iclusig will be the foundation for the company as it grows into "a major player in oncology", he added. The firm is also carrying out trials of the drug in Japan and is already building a commercial presence there, and is planning to file in Australia and Canada in the middle of the year. All told, Ariad estimates that with the current labelling there are around 2,500 patients eligible for treatment with the drug in the US; 3,800 in Europe; and 600 in Japan. Meanwhile, it is also focusing on expanding the uses of the drug into newly diagnosed CML patients and other Philadelphia-positive leukaemias, as well as other haematological malignancies and solid tumours.